Join us on our tour for an unforgettable dolphin swim experience! Our tour takes place on the beautiful west side of Oahu where you will have the chance to swim with Hawaiian Spinner dolphins in the wild. Our trained guides will make sure you're safe and comfortable in the water. 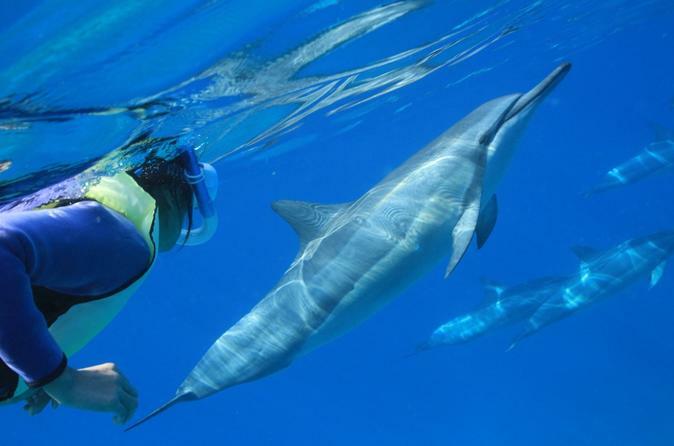 Meeting dolphins up-close will be an experience you will never forget! With transportation from Waikiki included, our tour also includes a traditional Hawaiian ceremony, snorkeling with tropical fish and sea turtles, and live entertainment. Enjoy our water slide, kayaks, and SUP board! Sit back and relax while our crew entertains you with hula dancing and ukulele performances or answer your questions on Hawaiian culture and history. And to top it off, we offer a delicious Taro bun cheeseburger (vegetarian options available) and snacks for lunch. It’s no wonder our dolphin swim tour is the longest-running and highest-rated on the island! Book your tour today! The longest-running and highest-rated dolphin snorkel tour on Oahu, Dolphins and You is a premiere ocean adventure for visitors and locals alike! With transportation from Waikiki included, our boat departs from Oahu's west coast. This premiere snorkel spot is optimal for experiencing a swim with dolphins in their natural habitat. We begin with a plumeria flower ceremony and chant, "E Ho Mai" to bring us good fortune during our voyage. Then we will cruise the West Side in search of Hawaiian Spinner Dolphins. As the name implies, Spinner Dolphins are known for their acrobatic spinning skills and long-snouts. The founder of Dolphins and You thought of dolphins as “angels in the sea”. You’ll see why! And our trained guides, life savers and free divers will make sure you feel safe and comfortable in the water. After swimming with the dolphins you'll come back on board to head to one of the premiere snorkel spots in the area, Makua Beach. Here you'll snorkel among a diverse array of sea life including "Honu" (sea turtles), fish, and occasionally manta rays, whales and monk seals. Dolphins and You is Hawaii Ecotourism Association certified for sustainable tour practices to help ensure that the marine life we encounter is around for generations to come! Our crew will pull out our amazing supply of water activities, such as kayaks, paddle boards, a water trampoline and our inflatable water slide! Or, just relax on the boat and enjoy a nice day on the water. The choice is yours! On the way back you'll be entertained by our amazing crew. They'll perform ukulele, authentic hula dance and songs. They might even teach you a dance! Before we get back to harbor you'll enjoy our signature taro bun cheeseburger (vegetarian options available) to replenish your energy. A quick group photo at the dock, and then you can head back on the bus to enjoy a leisurely ride back to Waikiki. We also offer professional quality photo and video packages so you don't have to worry about trying to capture the moments while you're out on the water. Let us collect the memories for you. You'll get them on a custom USB drive to take home to share with your friends and family. Additionally, wetsuits are available to rent for a small charge. Full details and options are available when you book. We can't wait to see you on the boat and give you the experience of a lifetime! Book your dolphin swim tour today!